Boeing B-29 Superfortress Bomber Go To War Vol 1 video covers the B-29 bomber of World War II. Included are six B-29 films as well as the B-29 pilot's manual on the DVD. Film #1 - Boeing B-29 Superfortress Flight Procedures and Combat Crew Functioning. This is a thorough pilot's view introduction to the premier bomber of World War II. Faster than a Zero, the peak of piston engine technology, with remote controlled gun turrets and a pressurized cabin, the Superfortress was the prime instrument in the Air Corp's very long range attack on the Japanese home islands. Stalin was so impressed with this plane that he ordered the Tupolev bureau to copy interned B-29s exactly. Over 1,000 of these Tu4 clones formed the core of the Soviet Air Force during the early years of the cold war. In B+W with a run time of about 37 minutes. Film #2 - The Last Bomb. This film vividly documents one of the almost forgotten chapters of World War II: the extreme long range B-29 bombing raids on Japan. Launched from hard won Pacific islands, these missions were over 3,000 miles round trip and could take 12 hours or more to complete. 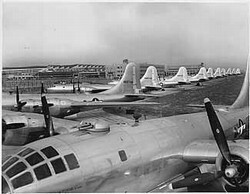 You'll also see the huge B-29 bases that were carved out on Guam, Tinian and Saipan. This rare late war color film, shot by combat camera men, documents all aspects of a XXI Bomber Command long distance daylight strike carried out at just 12,000' (!) on Tokyo in 1945. The mission is covered from initial planning stage by General Curtis LeMay and his staff, through fighter action and bombs away over target, to final touch down. As an added bonus, there's plenty of spectacular gun camera footage taken by escorting P-51 Mustangs ranging over southern Japan seeking targets of opportunity in the air and on the deck. These Mustang sorties were some of the longest and riskiest missions undertaken by any fighters during World War II. Just imagine -- flying thousands of miles over trackless ocean in a single engine ship to take on the enemy over their own territory! In color with a run time of about 37 minutes. Film #3 - "Saipan Superforts". This color footage shows the 73rd Bomb Wing based on Saipan in the Marianas in 1945. You'll see B-29 pilots and crews at work and on R&R, along with their striking B-29 Superfortresses. (the ultimate fate of many of the aircraft shown are documented during the film.). The "maximum effort" takeoff scene has an awe inspiring combination of 18 cylinder Wright R-3350-23 engine roar and a knock your socks off musical score that is guaranteed to raise goose bumps! As a bonus, you'll see a gallery of memorable Saipan Superfort nose art - all in living color. In color with a run time of about 15 minutes. Film #4 - "Air War Against Japan: XXI Bomber Command". This is the concise history of XXI Bomber Command's strategic campaign against the Japanese home islands. Along with documenting the changing strategy of the unfolding bomber offensive, you'll see both day and night B-29 actions, including rare footage of actual Japanese fighter attacks on big Superforts. In B+W with a run time of about 13 minutes. Film #5 - B-29s Over Dixie. A fascinating look inside the huge B-29 production facility built from scratch in Marrietta, Georgia. Includes detailed views of revolutionary new production techniques, assembly line work, and the training and care of thousands of new workers. The Georgia operation was much more than a manufacturing plant, it involved the creation of a complex community in an amazingly short time. This film is a tribute to the massive American war effort that was an essential element in the victory of the Allies. In B+W with a run time of about 20 minutes. Film #6 - Target Invisible. Remarkable documentary on how airborne radar was used for navigation and bombing on B-29 night strikes against Japan. Rare footage of radar in action on an actual Super Fortress mission. This story was so highly classified, it couldn't be told to the American people until after Japan surrendered. In B+W with a run time of about 8 minutes. A 92-page B-29 pilot's manual is included on the DVD. It is in .pdf file format with photos, systems diagrams, performance charts, procedures & more. The manual can be accessed on a computer equipped with a DVD drive.